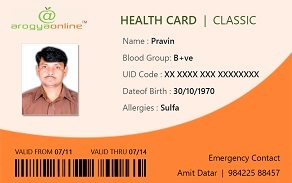 ArogyaOnline offers the Standard Health Card with Unique ArogyaOnline ID for individuals and family members, Card also available for groups of members of NGO's / Associations, Corporate /SME /MSME groups of employees. The discount benefits mentioned above are available at centers which are empaneled in the ArogyaOnline Affiliated Network. The percentage of discounts and the Terms and Conditions defined for availing the benefits varies from one vendor to another within the network. Also the period for availing the Discounts would vary from time to time. 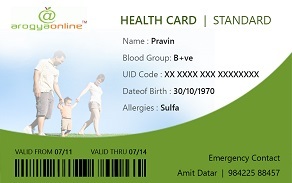 The Health card designed for all family members. Have your Health Records uploaded on ArogyaOnline portal and access the data online 24x7, wherever you go. A specially designed HOLISTIC FAMILY WELLNESS PACKAGE aimed at ensuring that the family stays healthy and fit round the year and adopt healthy eating and lifestyle habits. Cheque / DD to be drawn in favor of "AROGYAONLINE HEALTHCARE & INFORMATION SERVICES PVT LTD" and crossed A/c Payee Only. Cheque to be drawn in favor of "AROGYAONLINE HEALTHCARE & INFORMATION SERVICES PVT LTD" and crossed A/c Payee Only. The ARDP (Arogya Rejuvenation & Detox Program) is a specially designed program by our expert consultants for you to experience once in a year to cleanse the body of all toxins and relax the mind thus relieving it of stress we so unconsiously subject ourselves to. Just like your Car needs to be serviced every 10,000 kms for better mileage, your body and mind too need to checl-in for an anual servicing.. The package is a unique combination of Abhyangam + Swedanam + Basti + Shirodhara that is administered under strict supervision of an MD Ayurveda Doctor at our empaneled service centers only after evaluation of your Health Check report and Nadiparikshan. The protocols followed are documented and maintained on our portal for future reference.